Heat oven to 350°F. Cook and drain noodles as directed on package. Meanwhile, if necessary, cut broccoli florets into bite-size pieces. In large bowl, mix broccoli, carrots, tomatoes and bell peppers. In small bowl, mix ricotta cheese, Parmesan cheese and egg. In ungreased 13x9-inch (3-quart) glass baking dish, spread 2/3 cup Alfredo sauce. Top with 4 noodles. Spread half of the cheese mixture and 2 1/2 cups of the vegetables over noodles. Spoon 2/3 cup sauce in dollops over vegetables. Sprinkle with 1 cup of the mozzarella cheese. 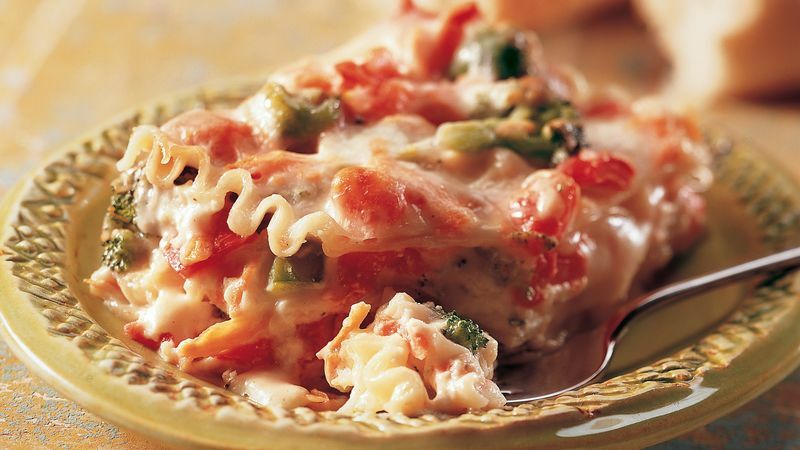 Top with 4 noodles; spread with remaining cheese mixture and 2 1/2 cups of vegetables. Spoon 2/3 cup sauce in dollops over vegetables. Sprinkle with 1 cup mozzarella cheese. Top with remaining 4 noodles and the vegetables. Spoon remaining sauce in dollops over vegetables. Sprinkle with remaining 2 cups mozzarella cheese. Bake uncovered 45 to 60 minutes or until bubbly and hot in center. Let stand 15 minutes before cutting. Slightly undercook the pasta when making lasagna because it cooks again in the oven. Make sure you thoroughly drain the broccoli and tomatoes so the lasagna won't be watery. Use a paper towel to remove any excess moisture from the broccoli.